View from Milos in August 2014. According to an interpretation of Homer's Odyssey, it is the island of the sun god Helios, where Odysseus's companions slaughtered the sacred cattle of the sun god. 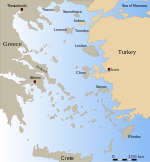 Previously, the island was also known by the name Ephyra (Ancient Greek: Έφυρα) or Ephora (Έφορα, meaning "watchtower"), because one could observe the sea from its highest point over long distances. Settlement in prehistoric times can be assumed due to remains of walls and arrowheads made of obsidian found on the island. Remains of a cistern probably of Roman or early Christian origin have also been found. ^ Smith, William, ed. (1854–1857). "Ephyra". 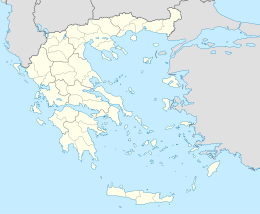 Dictionary of Greek and Roman Geography. London: John Murray. This page was last edited on 19 November 2018, at 18:40 (UTC).